While mechanical problems with a car are extremely debilitating, damaging your car’s body can be extremely problematic, too. Collisions, break-ins and thoughtless vandalism are all potential reasons why your car might need body repairs, and this can often be an expensive fix. In this article, the team at Munster Tyres will be discussing the most common body repairs and their causes. It’s not always an easy answer, but in general, body repairs take care of the external parts of the car, from frames to dents and scratches. Mechanical repairs, on the other hand, focus purely on the running parts of the car. If you’ve ever had your car scratched by errant shopping trolleys, vandals, or an angry ex-partner, you will know just how frustrating it is – and depending on where you live and park, you might know how common it can be, too! Depending on the depth of the scratches, and if there are dents and creases associated with them, repairing a paint scratch could be a simple DIY repair – that is, alcohol and a paint touch-up pen – or it could be a full professional refinishing! It’s also worth noting that if your car has been coated with special pearlescent or metallic paint, the fix will require extensive work. If your bumper has been dented but the paintwork remains intact, usually this means the cost of the repair will be significantly reduced. Also, if the back of the body panel can be accessed – for example, with bumpers, doors, the bonnet and the roof – and assuming the paint isn’t cracked, paintless dent repair can take of dents and dings with relatively little expense. It’s also a relatively quick repair, too, given that there is no paint involved. Unfortunately, vehicle collisions happen very often here in the UK and is certainly one of the most common car body repairs needed. If your car is damaged in a collision, it can be easy to simply pass off the damage as merely cosmetic in order to save time and money. However, we would always advise that, after a collision, you have your car examined at your local garage to ensure there is no mechanical damage. 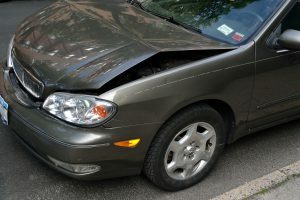 In the case of a collision, you will often find that the repairs can be covered by insurance. In such cases, there really is no excuse not to get the damage checked! Munster Tyres are experts in providing servicing and repairs for vehicles, ensuring that they are safe and in good working condition. We carry out a wide variety of car repairs and replacements – such as tyre fitting, brake and clutch repairs and, of course, car body work – both efficiently and to a high quality standard. Our experienced professionals are based in Fulham and provide services to individuals across North London. Contact us today for enquiries or for further information on the services we can provide.